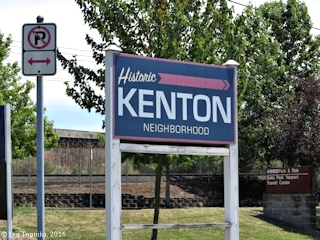 Click image to enlarge Historic Kenton sign, Portland, Oregon. Image taken June 15, 2016. Portland's Historic Kenton District is located north of downtown Portland, south of Hayden Island and the North Portland Harbor, east of the St. Johns neighborhood, and west of Interstate 5. Portions of the Columbia Slough flow through the Kenton District. 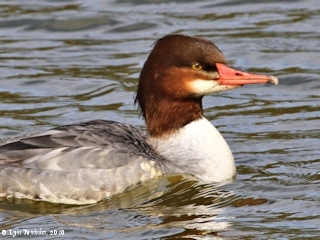 Also located within the Historic District are Force Lake, Heron Lakes Golf Course, the Portland Expo Center, the Portland International Raceway, and the Vanport Wetlands. In 1948 a flood destroyed much of the Kenton community including the community of Vanport, which at the times was Oregon's second largest city. "Kenton. (Multnomah). This post office, established in May 1910, is a branch of the Portland main post office. Kenton community was established by Geo. F. Heusner. 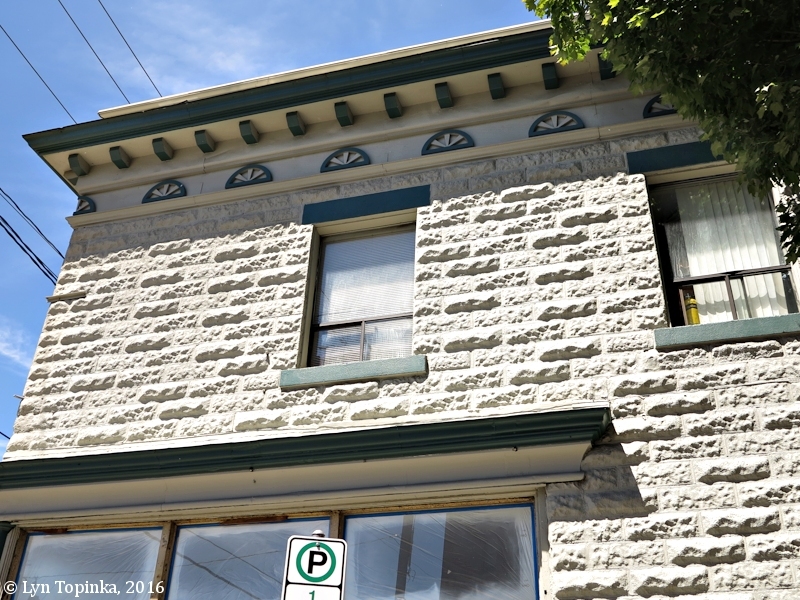 Heusner plattted this addition to the city of Portland for an industrial section in 1905. He originally intended to name the addition Kenwood but found he could not do this ecause there had been an addition to the city dedicated with that name. He selected the name Kenton. He told the writer that the name had no particular significance." 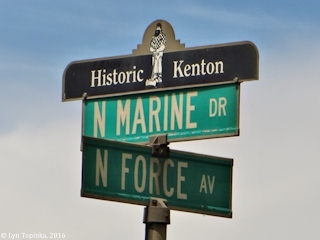 Click image to enlarge Historic Kenton Neighborhood sign, Portland, Oregon. Image taken June 19, 2016. "The land that is now Kenton was sold to the Associated Banking & Trust Company which had been organized in 1892 for the purpose of investing in and developing real estate. The corporation became indebted to the Ainsworth Bank, and on October 28, 1897, the tract was sold to cover debts by the Multnomah County Sheriff to J.C. Ainsworth for $15,000. The tract remained relatively undeveloped for years, and owes its development to the evolution of the meat industry. 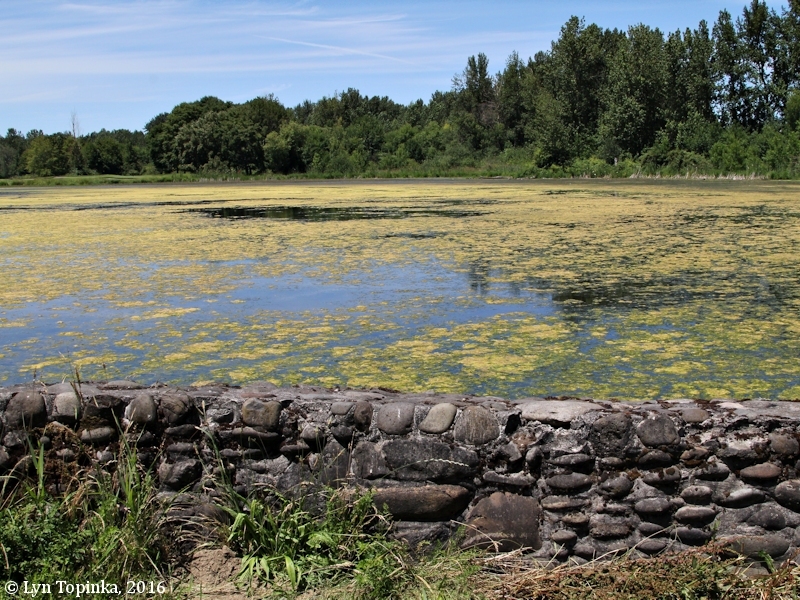 The area along the Oregon Slough became increasingly inviting to factories. By 1911, there were no less than twelve major manufacturing firms located along the slough, making this area second only to St. Johns as a manufacturing center. 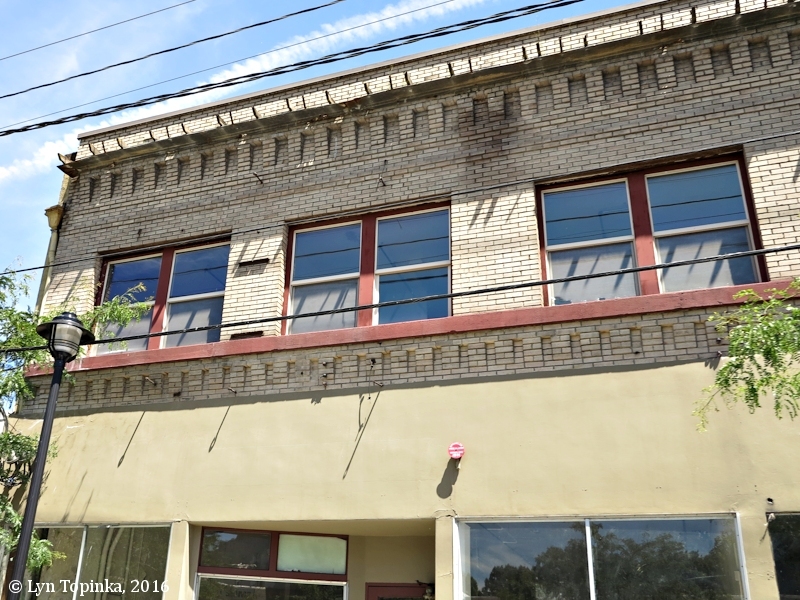 Swift & Co. was the catalyst for this development, with a plant that included the Portland Union Stockyards, Portland Cattle Load Company, Columbia Wool Basin Warehouse, Kenton Traction Company and others. Swift employed over 1500 workers, and by 1911 Portland had become the central livestock market in the Northwest. 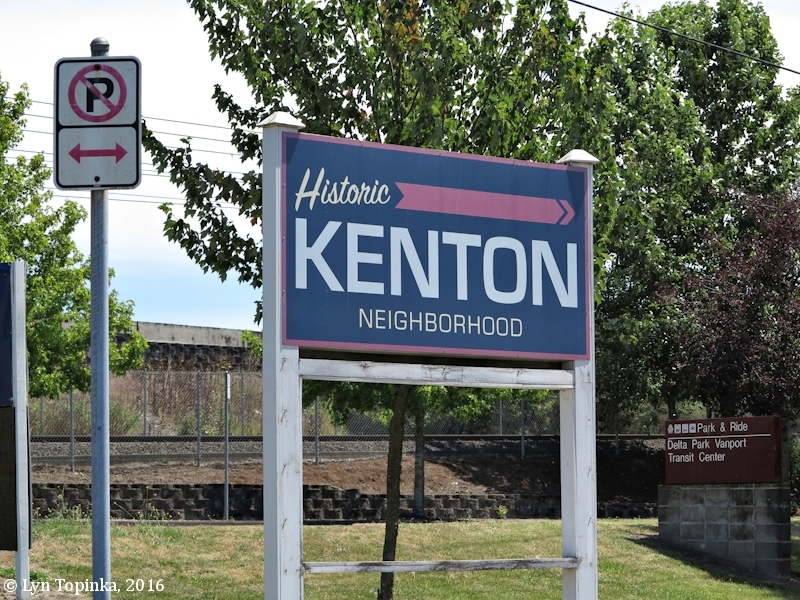 Within what is now the Kenton area was the second largest city in Oregon – Vanport. According to Kenton resident, Marge Davis, “Vanport City had a terrible effect on Kenton. The demise of Kenton was due partially to the highway — Interstate Avenue. Highway 99 used to come right through Kenton. The 1959 Oregon Centennial celebrations were held in Kenton. A large statue of Paul Bunyan was built at the intersection of North Interstate Avenue and North Argyle Street (just north of Kenton’s historic business district on North Denver Avenue) as a reminder of those centennial festivities. The statue now stands at the corner of North Interstate and North Denver, across from the N Denver Light Rail station and is considered a symbol of the neighborhood. The Paul Bunyan Statue was added to the National Register of Historic Places on January 28, 2009." Source: History of the Kenton Neighborhood, by Alta Mitchoff, courtesy Kenton Neighborhood Association website, 2016. 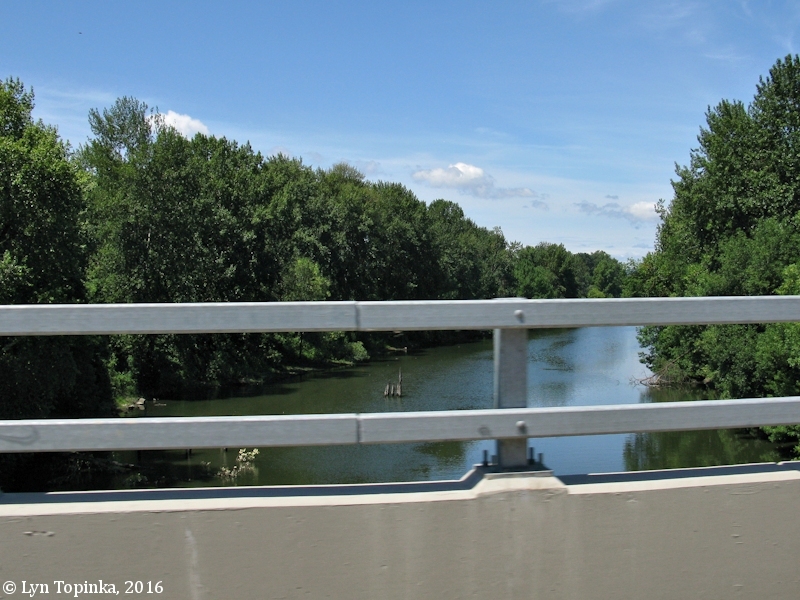 Two miles of Columbia Slough meanders through the Kenton District. 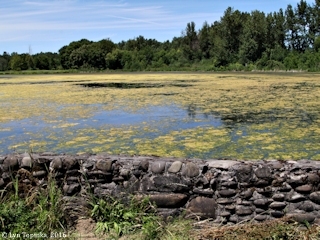 Click image to enlarge Columbia Slough as seen from Denver Avenue, Kenton District, Portland, Oregon. View looking west. Image taken July 6, 2016. Force Lake is a small lake located within Portland's Columbia Slough watershed, at approximately Columbia River Mile (RM) 106. 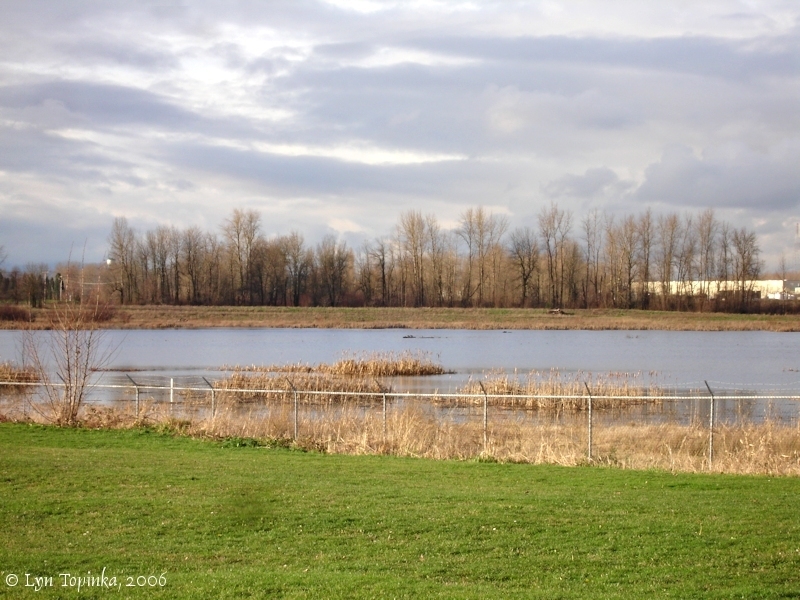 The Vanport Wetlands lies to the east and Smith and Bybee Lakes lie to the west. Click image to enlarge Force Lake, Portland, Oregon. Image taken June 19, 2016. 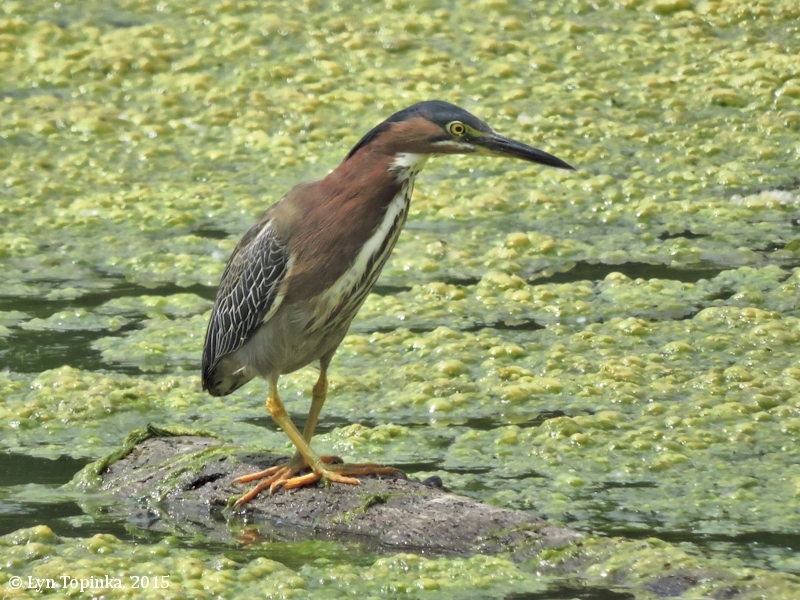 Click image to enlarge Green Heron, Force Lake, Portland, Oregon. 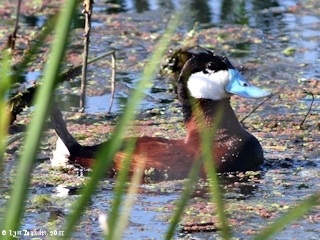 Image taken July 10, 2015. 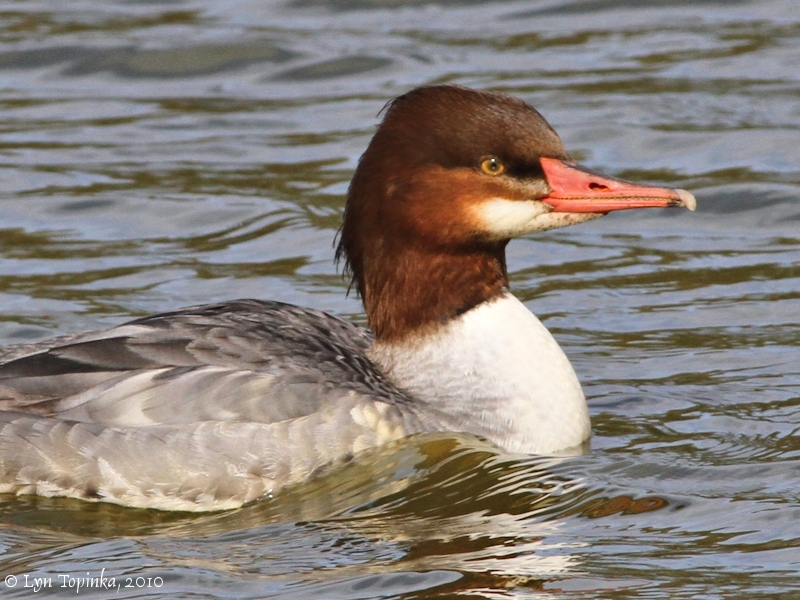 Click image to enlarge Common Merganser, female, Force Lake, Portland, Oregon. Image taken October 24, 2010. Click image to enlarge Violet-green Swallow and Cliff Swallow, Force Lake, Portland, Oregon. 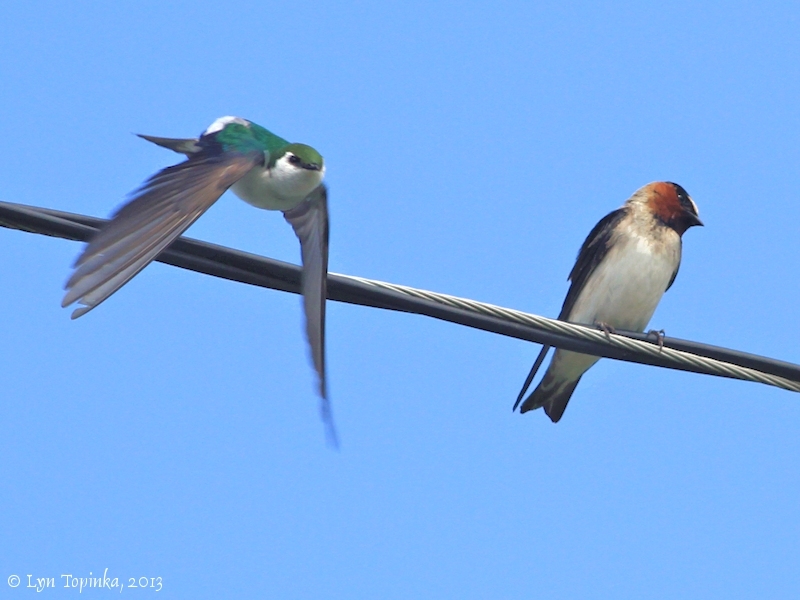 Image taken May 17, 2013. Heron Lakes and the Heron Lakes Golf Course lies west and southwest of Force Lake. The location was once part of the historic Vanport, the Portland city which was wiped out during a 1948 flood along the Columbia River. 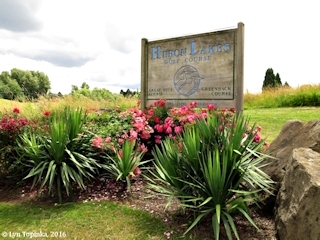 Click image to enlarge Heron Lakes Golf Course sign, Portland, Oregon. Image taken June 15, 2016. 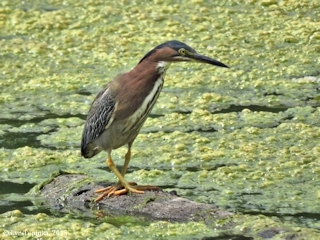 Click image to enlarge Heron Lakes Golf Course, Portland, Oregon. Image taken July 6, 2016. Click image to enlarge Cackling Geese and Gulls, Heron Lakes Golf Course, Portland, Oregon. Image taken January 1, 2012. 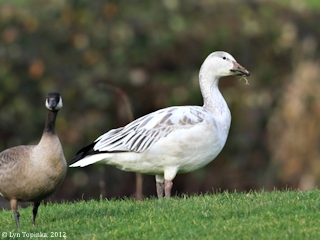 Click image to enlarge Snow Goose, Heron Lakes Golf Course, Portland, Oregon. Image taken January 1, 2012. The Kenton Commercial Historic District was added to the National Register of Historic Places in 2001 (District, #01000934). The District is roughly along Denver Avenue, from N. Willis Street to N. Watts Street, Portland, Oregon. 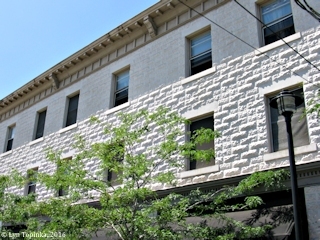 The two-story Bingham Building was built in 1911 and is an example of the Streetcar Era Commercial concrete block style. This building located on N. Denver and is located just north of the Dupey Block Building. Click image to enlarge Kenton's Bingham Building brick work, Kenton District, Portland, Oregon. 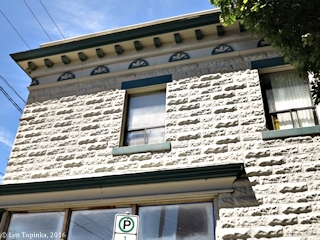 This building located on N. Denver and is located just north of the Dupey Block Building. Image taken June 19, 2016. 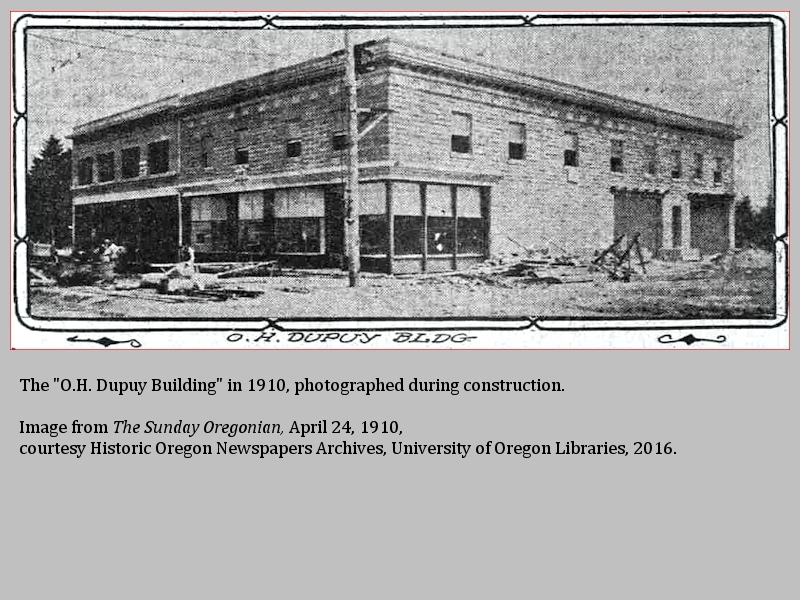 The Dupey Building (Block) was built in 1910 and is another example of the concrete block Streetcar Era Commercial style. Click image to enlarge HISTORICAL Newspaper Photo, O.H. Dupuy Building, 1910. The O.H. Dupuy Build;ing is located on the southeast corner of N. Denver and N. Kilpatrick. 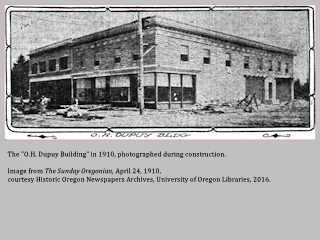 Image from the "Sunday Oregonian", April 24, 1910, courtesy Historic Oregon Newspapers Archives, University of Oregon Libraries, 2016. Click image to enlarge Kenton's Dupey Block brick work, Kenton District, Portland, Oregon. This building located on the northeast corner of N. Kilpatrick and N. Denver. Image taken June 19, 2016. The Kenton Hotel is another example of the concrete block style and was added to the National Register of Historic Places in 1990 (Architecture/Engineering, #90001522). The Kenton Hotel is located on the northwest corner of N. McClellan and N. Denver. 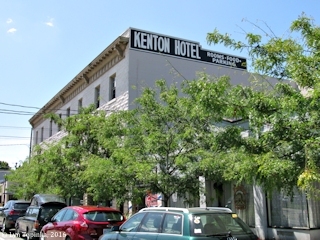 The Kenton Hotel (also known as the "Bailey and Bradford Hotel") was added to the National Register of Historic Places in 1990 (Architecture/Engineering, #90001522). According to the U.S. National Register of Historic Places Nomination Form (#90001522), the 100x90-foot Kenton Hotel was built by F.A. Bailey and W.H. Bradford and the plans were designed by Dyer and Company, the architectural department of the Swift Meat Packing Company. Construction began in September 1909 and was completed in April 1910, when it opened for business. The Hotel was constructed to accommodate cattlemen visiting the nearby Swift & Company Stockyards. The three-story building was made of concrete blocks which cost about the same as brick but gave the look of stone. It had 76 rooms on the two upper floors and room for five stores and the hotel lobby on the first floor. The Kenton Hotel is located on the northwest corner of N. McClellan and N. Denver. 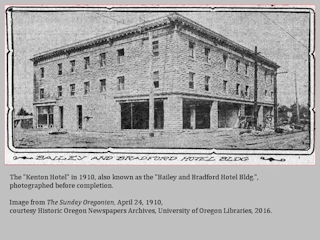 Click image to enlarge HISTORICAL Newspaper Photo, Kenton Hotel (also known as the "Bailey and Bradford Hotel"), 1910. The old Kenton Hotel is located on the northwest corner of N. McClellan and N. Denver. 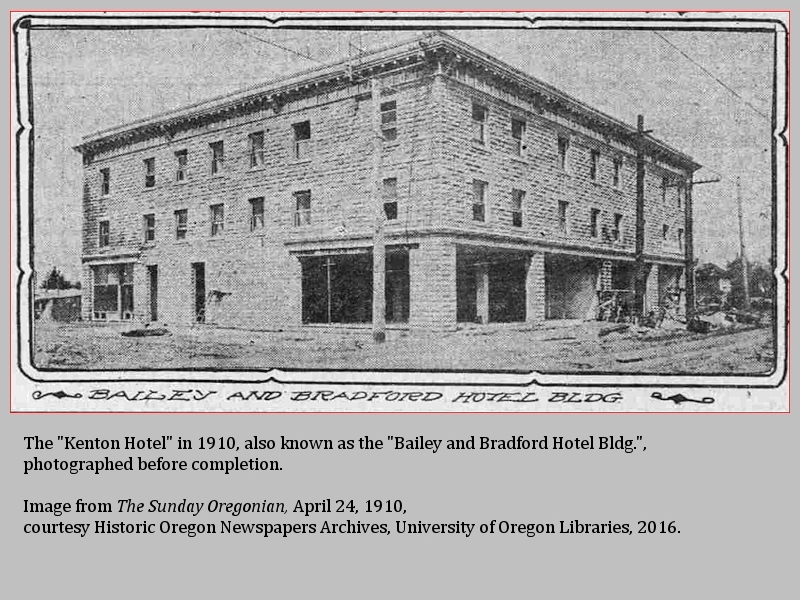 Image from the "Sunday Oregonian", April 24, 1910, courtesy Historic Oregon Newspapers Archives, University of Oregon Libraries, 2016. 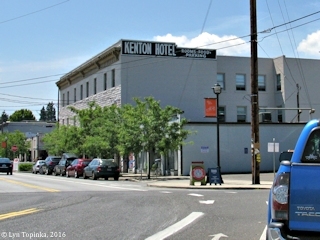 Click image to enlarge Kenton Hotel, Kenton Historic District, Portland, Oregon. Image taken July 6, 2016. 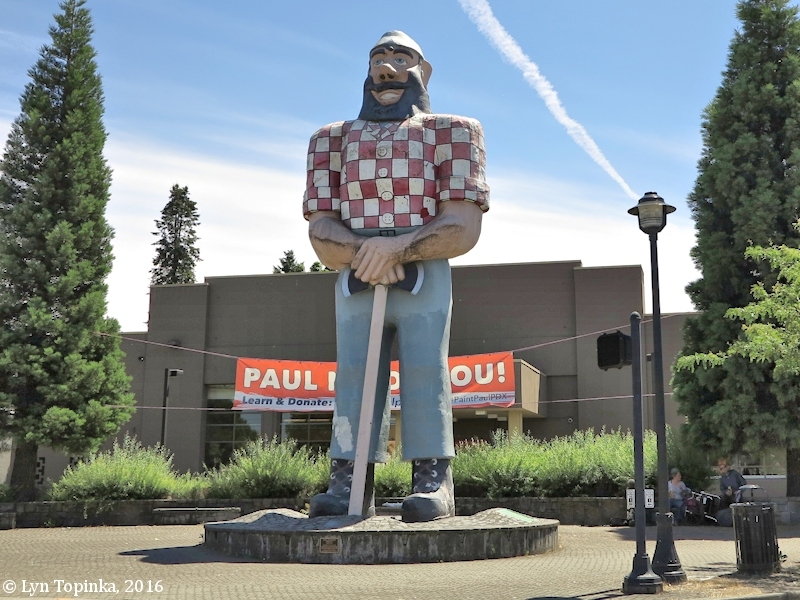 The 31-foot tall Paul Bunyan statue was added to the National Register of Historic Places in 2008 (Architecture/Engineering, #08001393). 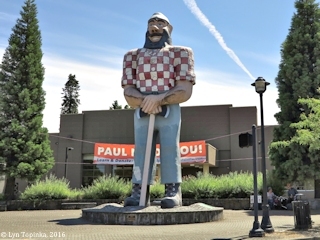 "Kenton’s 31-foot tall statue of Paul Bunyan was recently added to the National Register of Historical Places as Oregon’s only roadside architecture in the register. The statue was commissioned by the Kenton Businessmen’s Club to greet millions of visitors to the Centennial Exposition in 1959. Victor R. Nelson and his son Victor A. Nelson designed and crafted Paul Bunyan in the nearby Kenton Machine Works at a cost of $25,000." Click image to enlarge Kenton's Paul Bunyan, Kenton District, Portland, Oregon. Image taken June 19, 2016. 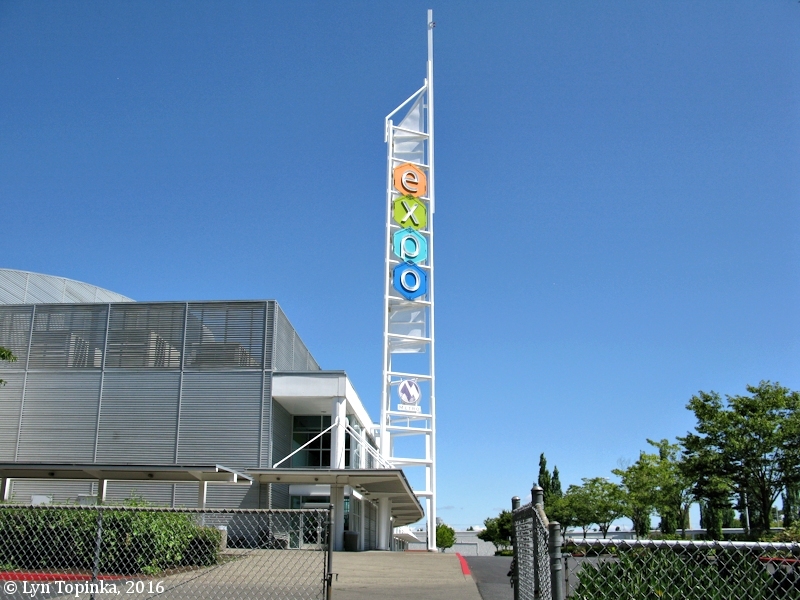 The Portland Expo Center history began in 1918 as an "Exposition" with a livestock shows, auctions, and rodeos. In 1942 the buildings became the temporary housing for Japanese families before they were resettled into internment camps, in 1959 the location was the home of the Oregon Centennial Exposition, celebrating 100 years of Oregon History, and between 1970 and 1990 the location was the home of the Multnomah County Fair. Today area continues as an exposition/trade show site. The Expo Center is located just north of historic Vanport, a city destroyed on May 30, 1948 when a dike broke and the Columbia River flooded and destroyed what was at the time Oregon's second largest city. Click image to enlarge Southern end, Portland Expo Center, Portland, Oregon. Image taken July 6, 2016. The southern end of the Portland Expo Center is "Hall E", built in 1997. 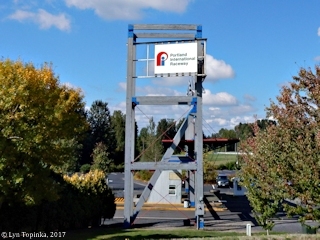 Click image to enlarge Portland Exposition Center, Portland, Oregon. View from Marine Drive. Image taken August 27, 2017. The northern end or "old section" of the Portland Expo Center houses "Hall A" and "Hall B", built in 1925 after the original site buildings burned. 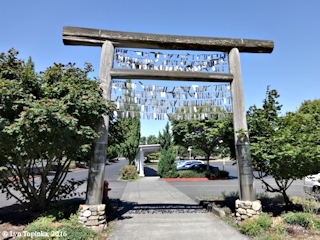 Click image to enlarge "Torii Gate", Portland Expo Center, Portland, Oregon. Image taken July 20, 2016. Four "Torii Gates" are located near the Light Rail Station and honor the 3,500 Japanese who were temporarily housed here before being relocated to internment camps. "More than half a century ago, the Portland International Raceway site was something quite different than a park: a city. Built during World War II as housing for Kaiser shipyard workers, the city of Vanport was home to nearly 40,000 people at its peak, making it the second largest city in Oregon. But, built behind dikes, Vanport was washed away by a flood in 1948, never to be rebuilt. The site, 640 acres of low-lying farmland, was America’s largest public housing project, and was built in less than 10 months. There was a library, post office, police station, several fire houses, an infirmary, stores, five elementary schools and a 750-seat movie theater. Vanport College, created after the war to support veterans headed to school on the G.I. Bill, moved after the flood to become Portland State University. Left from the remains of Vanport was an intact street system, and little else, when acquired by the City of Portland in 1960. It was a time of growing interest in sports car and drag racing, and the Portland Jaycees saw that the abandoned roads of Vanport had the potential to become a road race course. In 1961 the first Rose Cup race was held as part of the Portland Rose Festival. By 1965 the track was hosting regular drag races as well as motorcycle and kart races." 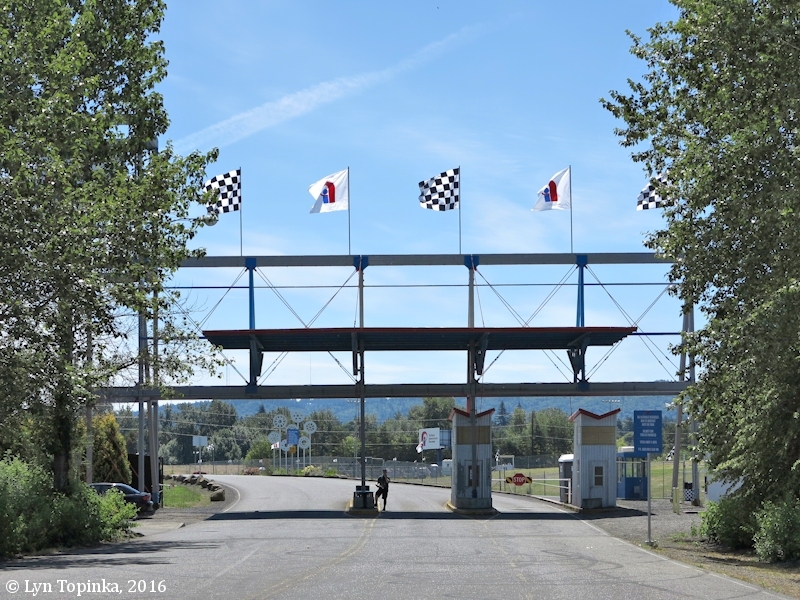 Source: Portland International Raceway website, 2016. 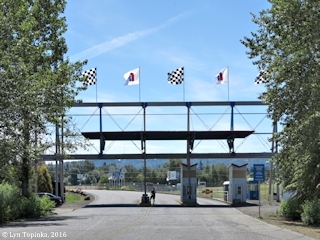 Click image to enlarge Portland International Raceway entrance, Portland, Oregon. 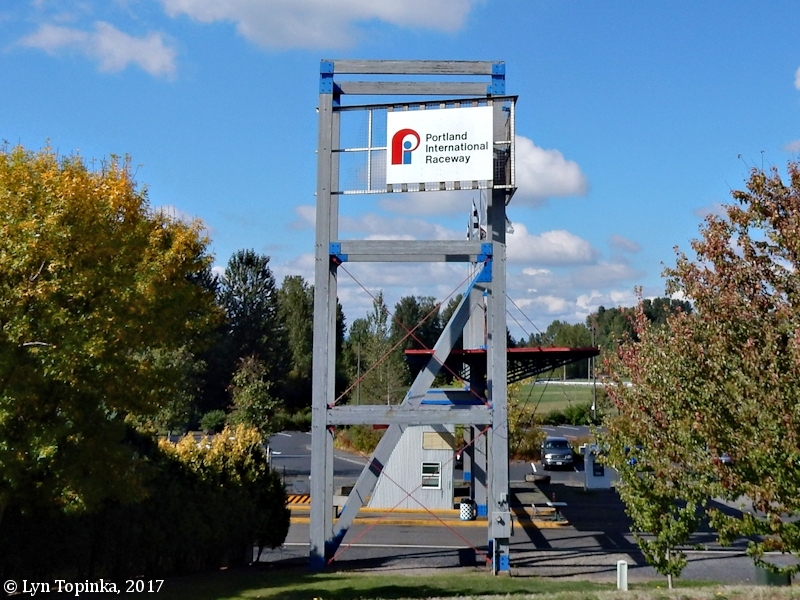 Image taken October 2, 2017. 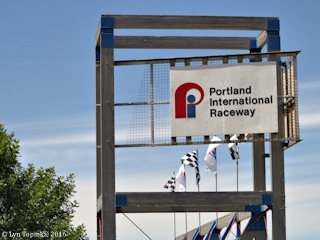 Click image to enlarge Portland International Raceway, Portland, Oregon. Image taken June 19, 2016. 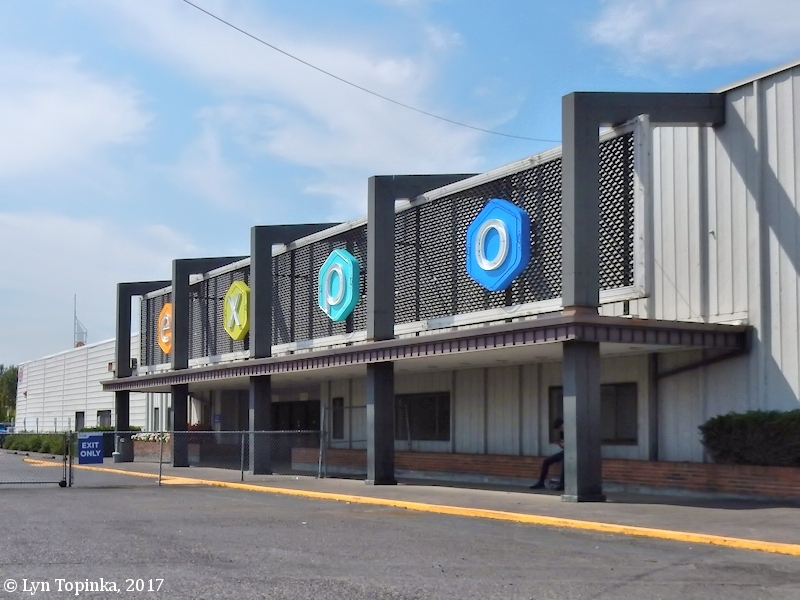 "The Pacific Livestock Expo held its last show in Portland in the 1980s and the buildings were sold to Multnomah County where the Multnomah County Fair remained for about 20 years. Portland’s Union Stockyards ceased operation in the 1980s. Then an Industrial Park was built in its place." 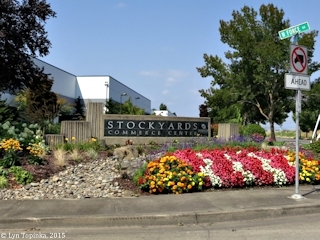 Click image to enlarge Stockyards Commerce Center sign, Portland, Oregon. Image taken August 13, 2015. 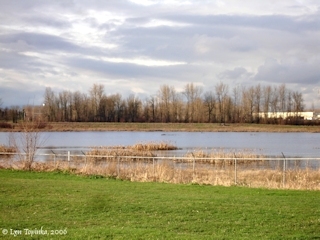 Click image to enlarge Looking across part of the Vanport Wetlands. View from West Delta Park. Image taken January 18 2006. 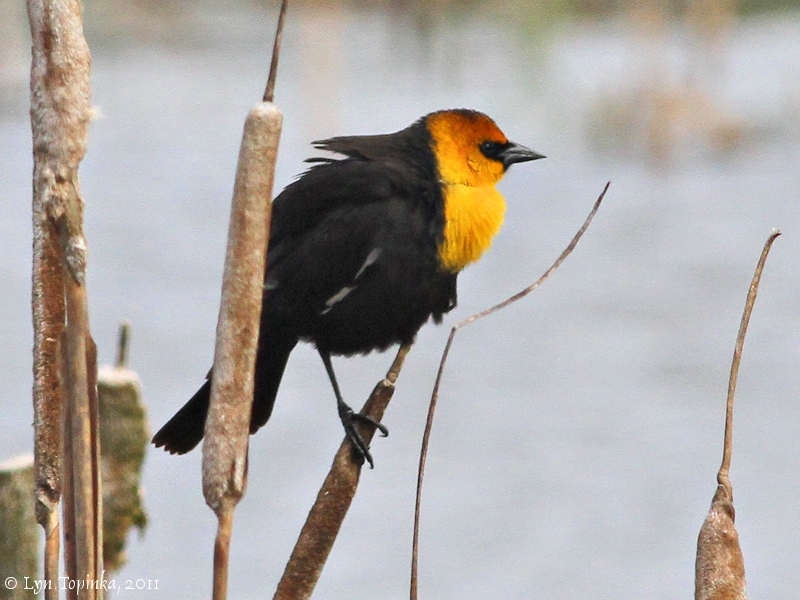 Click image to enlarge Yellow-headed Blackbird, male, Vanport Wetlands, Portland, Oregon. Image taken April 27, 2011. 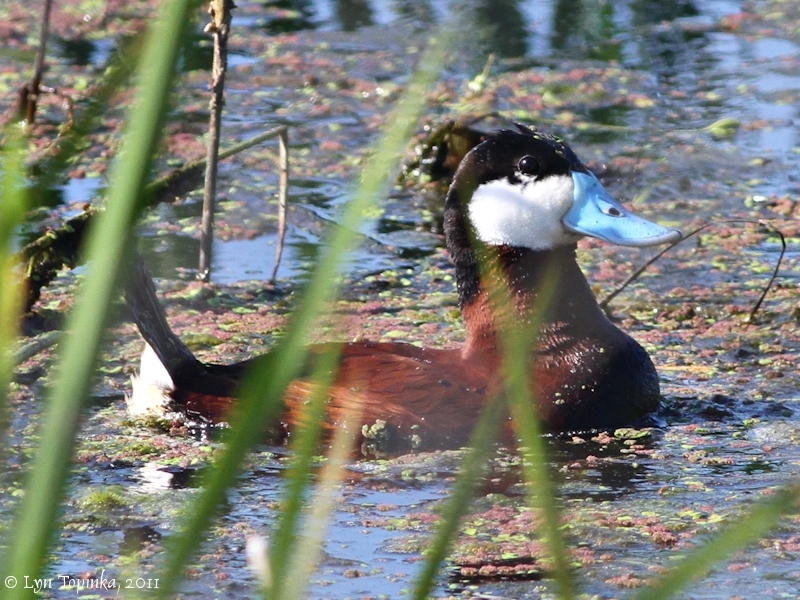 Click image to enlarge Ruddy Duck, male, Vanport Wetlands, Portland, Oregon. Image taken June 11, 2011.